When we looked at Halong Bay cruises, I checked checking the different activities available and kayaking was a popular one. As occasional kayakers, this would be a great opportunity to be active and discover the bay. Many of the tours lasted, however, longer than our stay, but I made sure that the Halong Bay cruise we selected offered kayaking. No way we would pass kayaking in Halong Bay! We knew that the kayak occurred on the second so we were happily surprised when our boat stopped for an unexpected session right on our first night. We just had visited the Dau Go Grotto and headed deep into Halong Bay when we anchored by a small village. It was late in the afternoon, but we promptly changed and jumped into the kayak to make the most of the hour. This gave us an impromptu glance at the life in Halong Bay fishing villages, and how they keep at their traditional way of life. However, the dark of the night came down quickly, and we paddled in dim lights to return to the boat. Thought it had been a short session, we had fun and it a good way to end our first day into the bay. More kayaking was scheduled for the next day – we could not wait for that moment. On that second day, the boat brought us to Luon Cave, situated on Bo Hon Island. A 60 m long and 4 m wide, the particularity of that cave is its low ceiling from 2.5 to 4 meters, depending on the tide. The tide was ebbing and the passage not yet fully practical so we swam around a boat for a while. Soon the cave started to open up and we launched our kayak through the section. A few areas felt tight and we had to bend down on the kayak, but since it was not a long passage, we soon reached the other side. To our surprise, the island was hollow and contained a brackish water lake. Monkeys supposedly lived on high straight cliffs, but we did not get to see or hear any. We kayaked for a while in the island lake, to check out the different sides of it and taking in the silence and scenery. As we looped back to our departure point, our guide took us through other small caves, one of them with no end so we had to paddle backward to exit. Only one or two kayaks could go at the time, not a place you want to be crowded! Going through the Luon Cave again, we headed back to the boat, but not before checking around the other boats and paddling in the open bay. As we left our kayaks, we thought how great a multi-day kayak trip should be. Another time, maybe. But at that instant, we were happy kayakers! The best time to visit Halong bay from March to May (Spring) and from September to November (Fall). During these two seasons, the weather is neither too hot nor too cold, and is perfect for exploring the area. Have you been kayaking in Halong Bay? How was your experience? Any other places to recommend for kayaking? In the US, we did several overnight trips which are always fun. We kayaked and camped in the Everglades National Park, Florida, and in several small lakes in the Sierra Nevada Mountains in California. Or simply kayaked for the day in the San Juan Islands by Seattle, and in Baja California, Mexico. One of the challenges is to find places you can rent kayaks. We have been thinking about buying our own kayaks, and since we like to travel, we looked into inflatable kayaks for future trips. How do you organize your own kayak trips? Do you own a kayak? rent it? If you like exploring Vietnam differently, go on a motorbike road trip in Ha Giang in the North of Vietnam close to Sapa and the Chinese border. And if biking is your thing, check our adventure on a motorbike in Kerala, India. Great post as usual full of info. outstanding picture, thank you for sharing with us, i really like this place and i will go there next summer with my wife to try to kayak there. 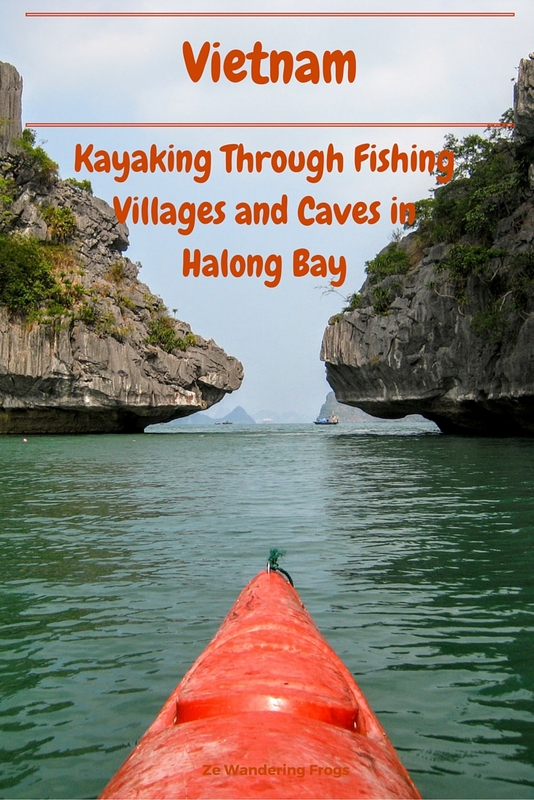 Enjoy, you will have fun kayaking in Halong Bay! When i see this pictures , i miss this day , i will try to get their soon with my wife. thank you for this outstanding picture. Enjoy your trip next time you visit Halong Bay again! Look cool. I plan to visit Halong bay when I have a chance. Thanks for your review about this place. What is the best time to visit here? Sorry for the delay in replying, I am just seeing your comment. The best time to travel to Halong Bay is during Spring and Fall Indeed, the temperatures from March to May and from September to November are the more agreeable – not too cold, not too hot! I am a big fan of kayaking. No matter fishing or just exploring, I just love to hit the water with my kayak. We kayak way too little, and agree, kayaking is an incredible adventure! Thank you! It was such a great experience, you would love it. Wow what an awesome destination! I have never kayaked in a cave before but it look so surreal! It was surreal! And got to be sure to time the kayaking with the tides, to ensure we could get through to the other side! Halong Bay is such a nice place to kayak. Some of the most beautiful kayak images I have ever seen. Looks like you guys had so much fun!! We had a blast for sure! Kayaking is such a great way to discover Halong Bay. It looks like a great destination for kayak fishing and also for traveling. Thanks for sharing such a nice spot. We are not into fishing in general so I can’t comment on kayak fishing, but for traveling for sure. Hi.. Fishing Village is so beautiful.. I am palnning my trip to this amazing Fishing Village.. thanks for sharing..
Have fun when you visit these fishing villages in Halong Bay! It was my first time to board a kayak.I was nervous but my guide helps me to recover it. It was nice It was lovely. Breathtaking scenery! Yes, it can be intimidating at first and depending on the sea conditions of course. Glad you enjoyed it too! That fishing village is amazing. I go different places across the world, I went Rio but didn’t see this kind of beautiful village anywhere. Really amazing. I will definitely make a tour there. Thanks a bunch for sharing this article with us. Though this is getting crowded in high season, kayaking is still a very peaceful way to explore, as you can get into places bigger boats won’t, such as smaller villages here and there. All pictures are awesome! Kayak is most recognizable natural place in the world. This is a wonderful place to enjoying the amazing fishing and boating with family and friends. Thanks for sharing this blog. Glad you like it, and agree, kayak gives an entirely different perspective to the place. This looks awesome. I didn’t Kayak when I visited and now I am wishing I had, crazy to skip it really and the caves look awesome. Thanks for sharing! Looks like a great spot to kayak, I love the caves! These were awesome! Just need to watch the tides!